Manufacturing capacities in pharmaceutical industries are increasing at a fast pace all over the world and led to higher production speeds and more complex production processes. To reduce the risk of product recalls and to protect consumers from contaminated medicines, strict safety regulations and guidelines aim at optimizing and monitoring pharma production processes. Inspection systems are the most important safeguards for pharmaceuticals. Vision systems are already state of the art to evaluate products according to shape, size, weight etc. in real time. 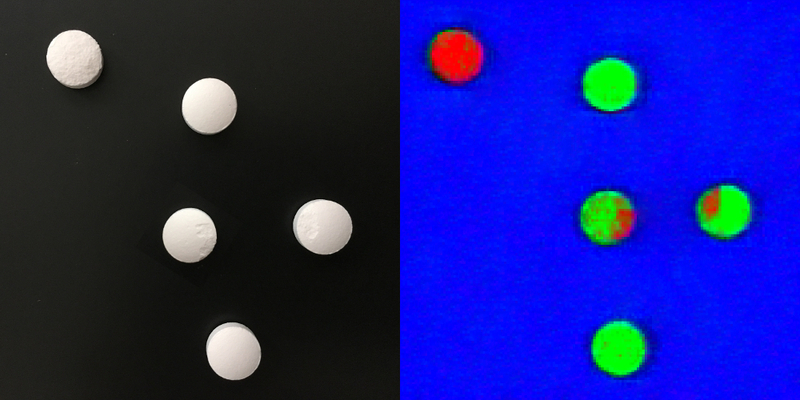 Using Chemical Colour Imaging now enables a 100% inspection of pharmaceuticals according to molecular properties. The examples below show the potential to improve quality assurance processes by implementing the Chemical Colour Imaging technology. Contrariwise to immediate-release dosage, modified-release dosage is a mechanism that is used in tablets (pills) and capsules and delivers a drug with a delay after its administration or for a sustained period of time or to a certain target in the body. This can be achieved through various formulations like liposomes and drug-polymer conjugates like hydrogels. With the present example we investigated the possibility to detect cracks in the sustained-release coating. For this we took tablets (Indapamid 1.5mg) and removed the complete coating from one tablet (top left) and scratched cracks in the coating of two other pills. Using a hyperspectral camera working in the NIR region (SPECIM FX17) and applying the Chemical Colour Imaging technology by means of our Perception STUDIO we could clearly show that the cracks in the coating can be detected. 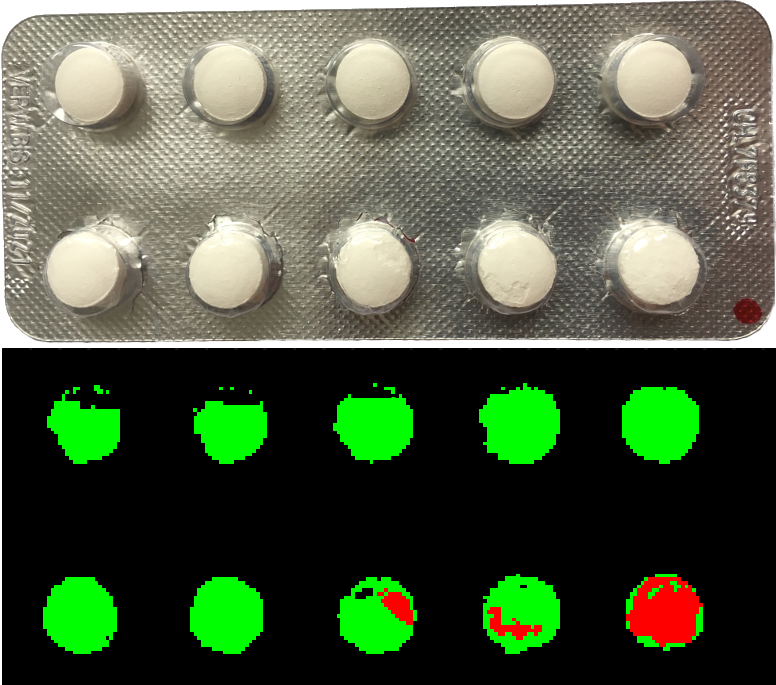 In the right output image the red colour represents the cracks on the pills. By using the Perception CORE this quality assurance process can be added for a 100% inspection of pills in high-speed production. If we assume that scratches and spalling not only occur in the productions process but also in the packaging process we tested the detection through a plastic blister too. Also through an NIR active plastic blister we could prove the detection of the scratches in the pill coating. Thereby it doesn’t matter if the blister is transparent or non-transparent for the human eye. A limitation would be if the blister material would be aluminium due the metals would reflect NIR radiation. In the image above the red colour represents the cracks in the coating again. 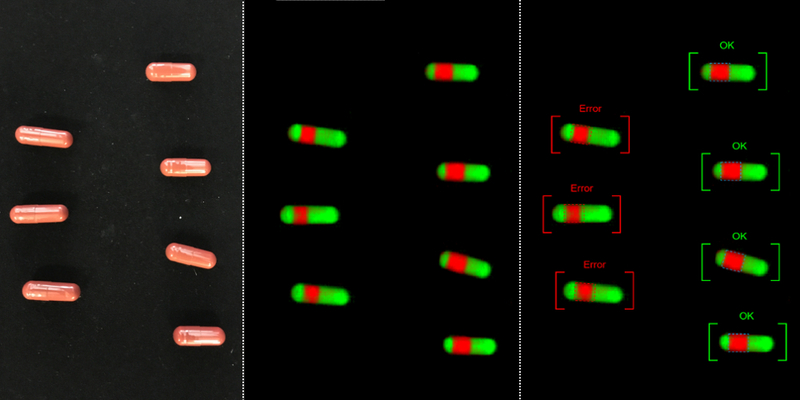 The next images show how Chemical Colour Imaging can improve quality control of capsules. In the first example we emptied some capsules, (upper row) closed them again and tried to identify empty capsules. This worked out very well and could be applied easily to industrial high speed processes. For the next example we looked for capsules that are not completely closed. Therefore we slightly opened some of the capsules (left row of capsules) and tried to survey the overlapping of the two capsule parts. We therefore applied a CCI method which is usually used to measure the thickness of coatings. In the centre image below you can see with your eyes that the overlap in the left row is smaller than in the right row. By using standard machine vision tools for the further processing the classification of good and bad ones was done very quickly. So this application could be proved too. Last but not least we checked the possibilities to detect capsules with different fillings. Sure this is not a case that typically appears in industrial processes. Nevertheless for hospitals, retirement homes and nursing homes the need for personalized drugs is increasing and those are often manually mixed and packed by pharmacists. An automated quality control for outbound and inbound logistics could optimize the effort for quality assurance. In the present case we filled capsules of the same material with two different active pharmaceutical ingredients and added an empty capsule too. 1st and 3rd capsule from the left were filled with Respicure. The 2nd was filled with Silybum Marianum (blessed milk thistle) and the last capsule was empty. 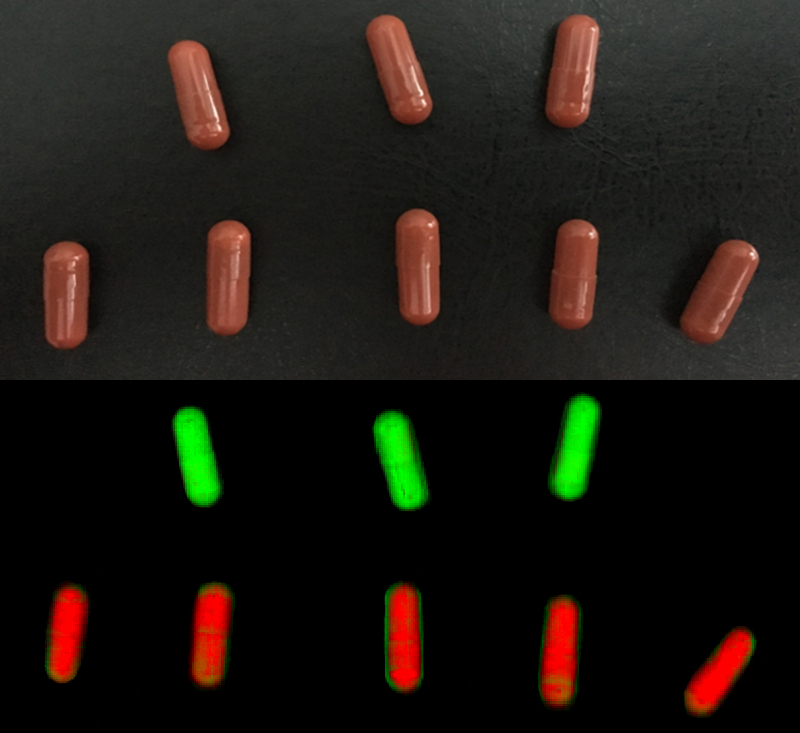 Applying Chemical Colour Imaging allows the quick identification of filled capsules. 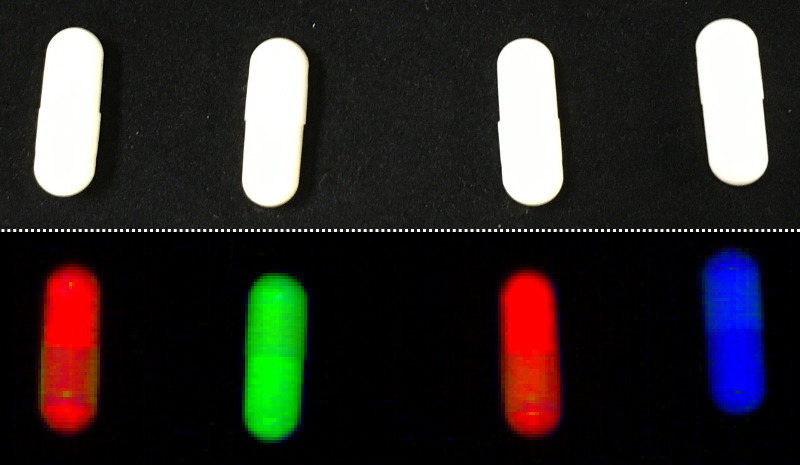 Summing up, Chemical Colour Imaging is a complementary vision technology that provides information on a molecular level and has a great potential to improve the quality assurance processes for both, to reduce the risk of product recalls and to protect consumers from faulty or contaminated medicines. Our Perception STUDIO enables vision engineers to develop applications based on Chemical Colour Imaging and to integrate hyperspectral cameras in an easy and understandable way. Do you want to see more? Then please visit us at CPhI in hall 4.1, booth 41G30 from 24th - 26th October 2017 and see various live demonstrations. Unique PAT tool enables 100% product inspection in pharmaceutical processes.